Fans who paid from $2000-$10,000 for a ticket to watch the UNC/Duke game and get a glimpse of Zion Williamson barely saw him play. With just 36 seconds in, Williamson collapsed on the court because his shoe fell apart. 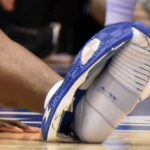 He was wearing a Nike PG 2.5 PE and, according to Duke coach Mike Krzyzewski, Zion suffered “a mild knee sprain”. The Tar Heels beat Duke 88-72, but all anyone could talk about was the freak injury to Zion and whether or not the almost certain #1 pick in the NBA draft will continue to play this season or sit out for fear of another injury.